Mladá Boleslav, 12 April 2018 – ŠKODA AUTO has made a successful start to 2018. The Czech carmaker achieved the best month in its history in March, at the same time closing its most successful first quarter to date. The company recorded 120,200 deliveries last month, exceeding the previous year’s strong result by 10.7% (March 2017: 108,500 vehicles). In the first quarter of 2018 – between January and March – ŠKODA AUTO delivered a total of 316,700 vehicles to customers worldwide, an increase of 11.7% over the previous year (January to March 2017: 283,500 vehicles). 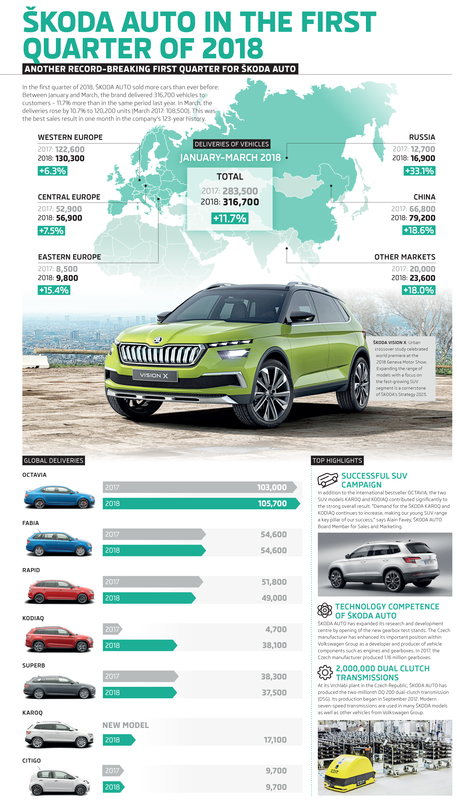 The extremely positive development in the core markets of China, Russia, Europe and India also contributed to the record sales, as did the significant gains of the ŠKODA OCTAVIA and KODIAQ model series. 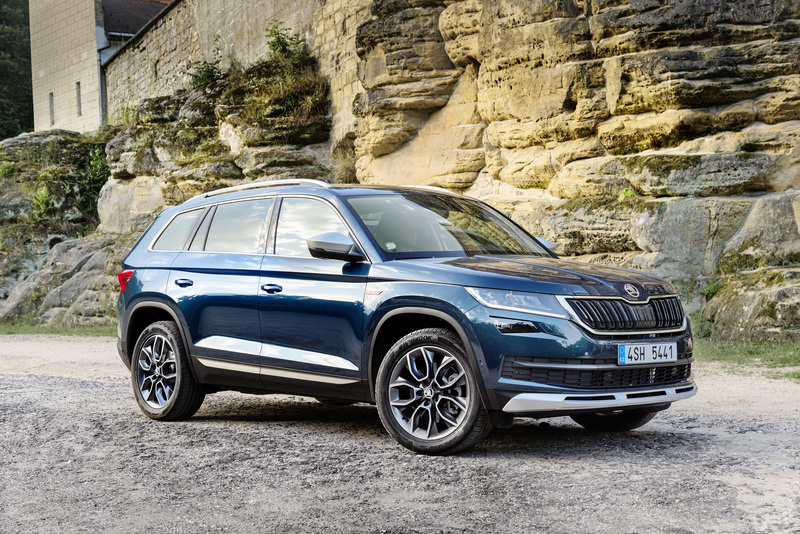 The ŠKODA KAROQ is also a pillar of the company’s continued success, with 17,100 units sold in the first three months of 2018 alone. 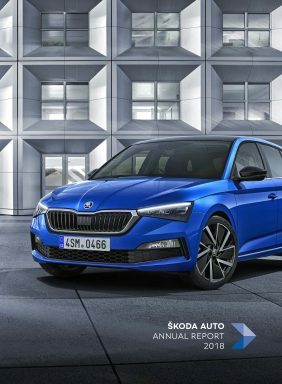 “ŠKODA’s success last year continues seamlessly into a strong first quarter of 2018. Achieving the best first quarter and delivering 120,200 vehicles in one month for the first time forms an excellent basis for the brand’s further development,” says Alain Favey, ŠKODA AUTO Board Member for Sales and Marketing. ŠKODA AUTO presented at the International Motor Show in Geneva in March several world premieres. The traditional Czech company unveiled the urban crossover hybrid study ŠKODA VISION X, which provides an outlook on the brand’s future models, at the international motor show in Geneva. The ŠKODA KODIAQ Laurin & Klement also entered the spotlight as the new top model in the successful SUV series. In addition, the extensively revised ŠKODA FABIA was presented to the public for the first time. In Western Europe, ŠKODA AUTO delivered 53,400 vehicles in March, remaining at the previous year’s level (March 2017: 53,600 vehicles). In the first quarter of the year, the brand increased its deliveries by 6.3% to 130,300 vehicles (January to March 2017: 122,600). With 17,100 deliveries, Germany remained the second largest single market in March (March 2017: 17,100 vehicles). In the first quarter, ŠKODA AUTO recorded growth of 9.4% in Germany, delivering 44,600 vehicles to customers (first quarter of 2017: 40,800 vehicles). The manufacturer posted double-digit growth rates between January and March in Italy (7,700 vehicles, +14.9%), France (7,500 vehicles, +20.5%), Austria (6,900 vehicles, +12.5%), the Netherlands (4,500 vehicles +27.5%), Sweden (4,500, +11.7%) and Greece (1,000 vehicles, +66.4%). (1,500 vehicles, up 58.8%), deliveries to customers increased in the first quarter of this year. In Eastern Europe excluding Russia, the Czech carmaker also grew significantly in March. Deliveries were up 19.5% to 3,900 vehicles (March 2017: 3,300 vehicles). With 9,800 deliveries, ŠKODA AUTO recorded an increase of 15.4% in the first quarter compared to the previous year (January to March 2017: 8,500 vehicles). The company grew by double-digit figures in Romania (2,700 vehicles, +25.8%), Baltic States (2,000 vehicles, +15.0%), Serbia (1,500 vehicles, +11.2%) and Bulgaria (900 vehicles, +33.4%). The brand also recorded positive developments in Russia, with deliveries increasing by 33.6% to 6,500 vehicles (March 2017: 4,900 vehicles). During the first three months of the year, deliveries increased by 33.1% to 16,900 vehicles (first quarter of 2017: 12,700 vehicles). In China, the world’s most important market, ŠKODA AUTO’s deliveries increased by 29.0% to 28,100 vehicles in March (March 2017: 21,800 vehicles). In the first quarter, deliveries in the region were up 18.6% on the previous year, increasing to 79,200 vehicles (January to March 2017: 66,800 vehicles). The Czech automobile manufacturer expects further growth impetus from the compact SUV ŠKODA KAROQ, which was launched in the Chinese market at the end of March. In Israel deliveries to ŠKODA AUTO customers rose by 1.8% to 1,900 vehicles in March, remaining on the level of the same month last year (March 2017: 1,900 vehicles). Deliveries in Israel fell by 10.4% to 6,700 vehicles in the first quarter (first quarter of 2017: 7,500 vehicles). In India, the company delivered 1,500 vehicles in March (March 2017: 1,600, -4.6%). With a total of 4,200 deliveries, the company recorded an increase of 7.3% in the first quarter compared to the same period last year (first quarter of 2017: 3,900 vehicles).